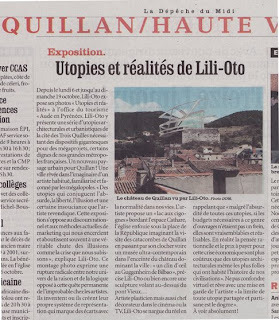 lili-oto artiste plasticien et artiste contemporain en art contemporain et arts visuels. 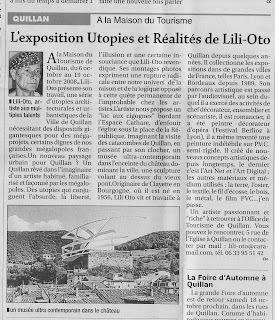 lili-oto artiste plasticien et artiste contemporain en art contemporain et arts visuels. : "– Envoyé à l'aide de la barre d'outils Google"
It is surprising to see a head of state Sarkozy French in a democratic country that designate himself as "president" of "counsil for the contemporary création". We have in our minds the same attitude of some totalitarian states towards the creation and artists, Stalin, Mao, Hitler, Mussolini, Louis XIV, Franco, etc? President of the Republic in France Nicolas Sarkozy states to want “to give a kick in the anthill". Today, French artists we believe that we are threatened and endangered. 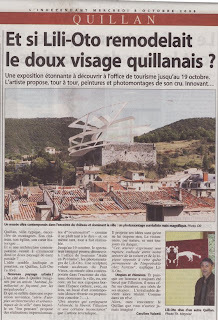 We are afraid, the french artists are in danger or peril of their lifes? With Sarkozy we live in poverty, let us live in fear, in terror, in fear and repression in France and in Europe? artist, I am very worried about our future, the international community and artists around the world should support us! Give your banker a gift this year ! 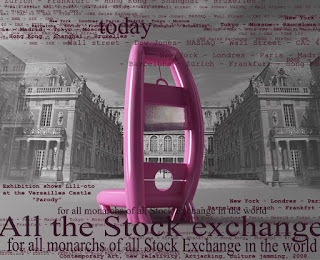 give your banker a candy-pink guillotine for the new year in 2009 to thank for this economic crisis in USA... it's give your banker preferential treatment! give your eyes a treat! find a charity You can trust, your guide for intelligent giving!!! 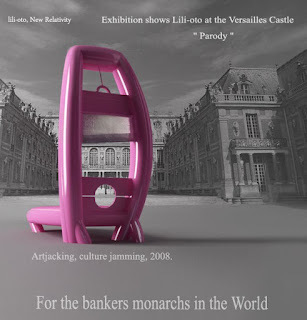 Jeff Koons parodied by lili-oto, on his exhibition show at Versailles Castle in France ! 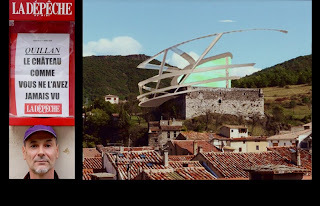 No for the neo pop, no for this artistic movement ! No for this wall street art ! The dissident french artist Lili-oto parodies the exhibition shows Jeff Koons at the Versailles Castle, facing the economic crisis, facing a bank crisis, the artistic movement New Relativity, artjacking, culture jamming, 2008.
the french newspaper the Dépèche, "Quillan the castle as you've never seen"
Photo : Lili-oto photographed with its proposed contemporary art museum on the ruins of the castle in a small town.